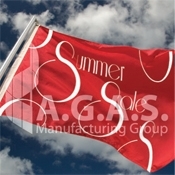 Advertising Flags are a perfect way to attract customers and promote your business. We have a wide selection of message flags – vertical message flags, horizontal message flags, car message flags, light post banners, and feather flags. Our message flags range from Open House flags to For Sale flags, to Day Care flags, and much more. 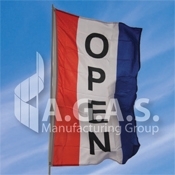 These heavy duty 200 Denier Nylon flags are great for outdoor signage and promoting your business or event. 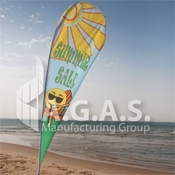 Our specialty designs include a range of flags for festivals, fairs, trade shows, and events. If you're looking for indoor signs and outdoor signs such as bathroom signs, wine tasting signs, entrance signs, first aid signs, or welcome signs, you'll find them on the Online Flag Store. 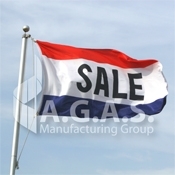 We also have special message flags and designs for Car Dealership advertisements. We sell car dealership flags in Spanish and car dealership flags in English, with popular car advertising messages. 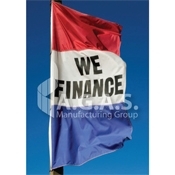 Many of our flags can be customized to have the flag colors that you desire. 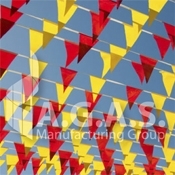 AGAS carries horizontal message flags with over 48 different phrases, including 8 Spanish messages. Each flag has 3 stripes that come in our stock colors – red, white & blue, or you can choose your own top and bottom stripe colors. 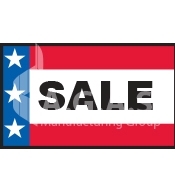 Patriotic horizontal message flags are great for advertising your business while at the same time expressing your company's patriotism. 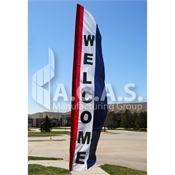 These durable 200D Nylon flags are great for outdoor display flags and events. You'll find a variety of phrases for our Vertical Message Flags with Vertical stripes. You can choose from our flags with stock color stripes, or customize the message flags with your own color stripes. The Online Flag Store carries Vertical Message flags with horizontal stripes with 18 different phrases. 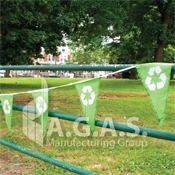 We have message flags with stock colors, or you can customize the stripes with your own colors. Specialty message flags are great for standalone advertising signs outside your business or car dealership. These large red, white, and blue flags come in a variety of shapes that will draw attention. The Online Flag Store sells a variety of special design advertising flags which are perfect for business signs, event signs, sale flags, festival signs, and car dealership advertising. 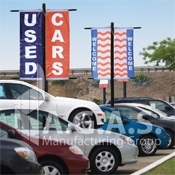 Light Post Banners (or Avenue Banners) are great for car dealership advertising, parking lots, or city street lights. These large banners draw attention and add patriotic flare. Whether you're looking for a business advertising flag, a fair or festival flag, or a car dealership flag, our specialty standalone advertising flags have a design that will fit your needs. 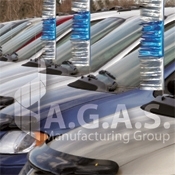 Car message flags and antenna flags are an easy way to attract customers to your car dealership lot. They are a cost-effective way to advertise your car dealership, including special events and sales. 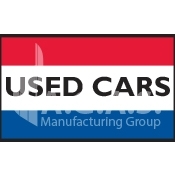 You'll find a variety of patriotic car flags with messages on the Online Flag Store. 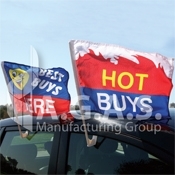 These car flags are a great way to display your car dealership's patriotism as a part of its advertising signs. 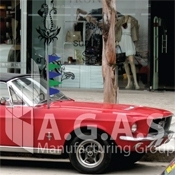 AGAS has an assortment of specialty design advertising car flags and antenna flags. Whether you're looking for a "Hybrid car" flag or a "Sale" car flag, we have a promotional flag for your car dealership. 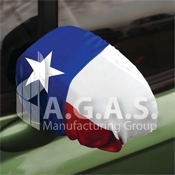 Maximize your advertising space on your car lot and select from one of our 16 side mirror cover designs that add extra flare to your car dealership advertising. 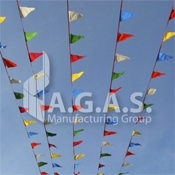 AGAS carries a wide selection of antenna pennant towers with different colors including fluorescent color pennants. These are great displays for car shows, parades, and car dealerships. 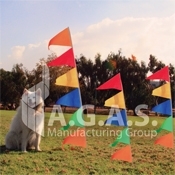 Ground pennant towers are a great standalone flag that easily draw attention. You can choose up to six different color pennants that come on a six foot fiberglass pole. Overhead, colorful pennant streamers are great for attracting attention to your car dealership, shop, sale or event. Choose from a variety of streamers with pennants in all one color, or multi color pennants. 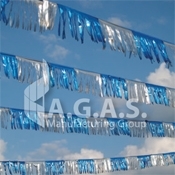 Pennant streamers are a great way to attract attention. You can now select up to 3 alternating colors for your pennant streamers, and you can choose the length of the streamer and size of the pennants. The Online Flag Store carries a variety of special designs for pennant streamers. These designs are perfect for your party, event, sale, or car dealership advertising. Antenna hula streamers are a colorful, fun way to attract attention to your car whether you have a car dealership, are presenting in a car show, or are driving in a parade. Hula streamers are flashy, attractive, and draw attention to your business, event, or car dealership. These colorful overhead streamers are 60 feet long and come in 5 mil plastic or shiny metallic plastic. Can't find the exact message flags you're looking for? Or do you want a custom advertising sign for your company? We specialize in making the most intricate designs and graphics come to life on custom flags and banners. 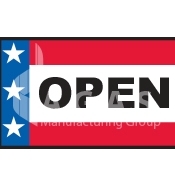 If you have a custom flag design or would like to add your company logo to a sign, please contact us at sales@agasmfg.com or 1 (866) 269-3524.